what are essentially islands of seclusion from which migrations, either in or out, are not easily accomplished. Isolation, both physical and biological, is a feature of many mountain-top plant populations. At the highest sites plant communities cannot benefit from an input of seeds and other propagules washing or blowing down the mountainside from vegetation that lives above them. Reproduction and persistence in such sites is therefore largely limited to the plants that are already there or else from those seeds that blow uphill or are transported there by animals. 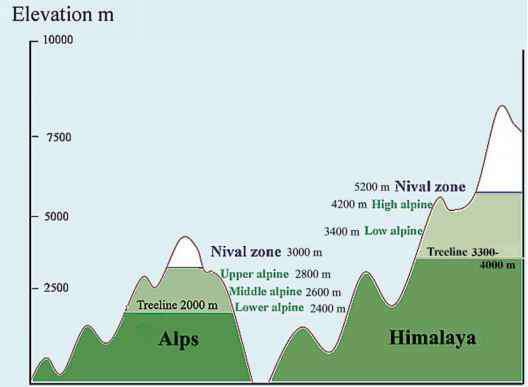 Immigration from other mountain sites will depend on the height and relative isolation of the mountain. 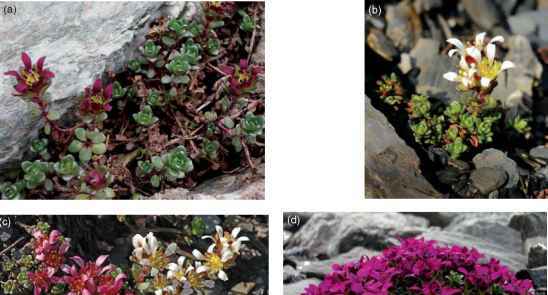 It is therefore not surprising that endemic species and subspecies are a feature of many high mountain floras. A classic study of endemism in Sri Lanka (Willis, 1922) noted that the commonest sites for endemic species were on mountain summits. Of the 809 species offlowering plants endemic to the island some 200 were confined to very small areas and half of these occurred on mountain tops or in small groups of mountains. This was particularly noticeable in the genus Coleus where many endemic species are restricted to localized mountain groups. In an earlier series of papers Willis had put forward his classic Age and Area theory (1915) which first advanced the hypothesis that the larger the area covered by a species, the older is that species (Willis, 1922). This work attracted much interest and comment when it was published, but is now largely disregarded as many factors other than age determine the area occupied by a species, including physical and climatic barriers, and the adaptability of species under different environments. In addition, the hypothesis failed to understand the complexity of endemism and that there exist two widely different types of endemic forms, 'relicts' and 'indigenes' (climatic relicts and recently evolved endemics - see Sections 1.6.1, 1.6.2). Plant species also differ widely in the rate at which they evolve, and hence in the rapidity at which endemic elements will arise. Even when the 'Age and Area' concept was first put forward it was considered untenable as 'no single hypothesis, however valuable it may be in explaining certain facts, can be used as a key to the whole problem' (Sinnott, 1917). Despite the limitations of the 'Age and Area' theory, endemism in mountain species appears to be a phenomenon particularly associated with the warmer regions of the world where old established floras are preserved on ancient mountain tops with a climate that is radically different from the valleys below. Mountain endemics are few in the lands bordering the North Atlantic, possibly due to the Pleistocene impoverishment of the flora brought about by glaciation and the presence of geographical land bridges. In northern coastal regions, the early Holocene vegetation from shore to mountain consisted largely of arctic-alpine species as can be seen in Greenland today. Also, the mountains of Europe consist of ranges rather than isolated high peaks, the latter being also the case with East African volcanoes. Where endemics do occur in Europe they may not necessarily be due to in situ evolution. 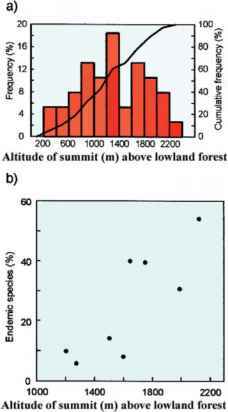 The increasing warmth of the last 12 000 years has clearly played a role in limiting the range of mountain species that were once more common. Consequently, many endemic species are likely to be late-glacial relicts rather than recently evolved endemics. 40-50 million years old, although some can be as young as 10 million years (LUttge, 1997). 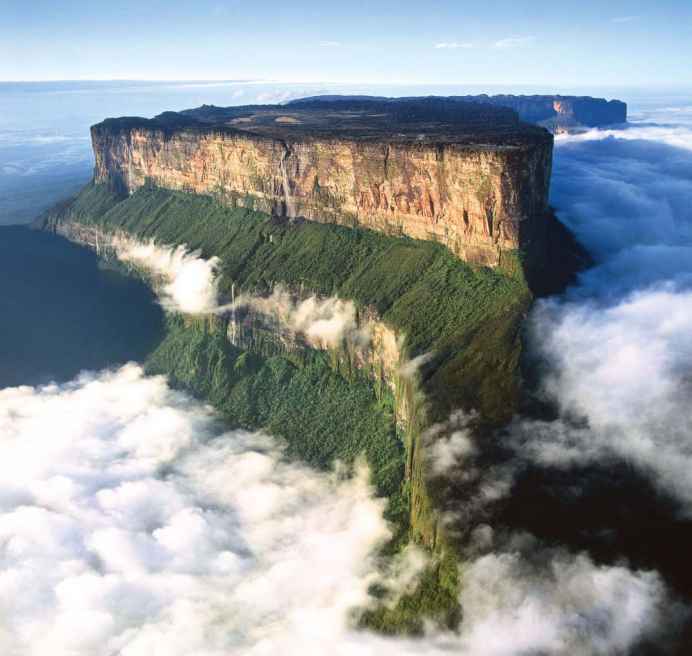 Particularly striking are the inselbergs situated in the north-east of South America where Venezuela, Guyana and Brazil meet. The indigenous name tepuis is used to denote these enormous isolated South American inselbergs. Their height can vary, with the highest examples occurring in French Guiana. Possibly the most famous inselberg is Roraima, 2810 m high, 16 km long, and up to 5 km wide, first climbed in 1884 by the British botanist Everard im Thurn, whose subsequent lecture in London on this feat inspired Arthur Conan Doyle (1912) to write his time-warp novel The Lost World, which imagined a reentry by intrepid explorers to the era of the dinosaurs (Fig. 10.5). The rock on the plateau of Roraima is a hard, ancient quartzite that has weathered into strange shapes and created a grotesque landscape of castellations and chasms (Fig. 10.6). Because of the frequent and heavy rainfall the quartzite, instead of having a white colour, is black due to a ubiquitous covering of cyanobacteria, which is a frequent occurrence on many inselbergs. The combination of hard rocks and constant leaching from heavy rainfall results in mineral-deficient sand and gravel soils which accumulate in the chasms and fissures in the rock surfaces. Species that flourish under such conditions are those with special modes of nutrition. Insectivorous species are common, such as the cosmopolitan sundews (Drosera spp.) and the pitcher plants (Sarraceniaceae). The pitcher plant genus Heliamphora (Fig. 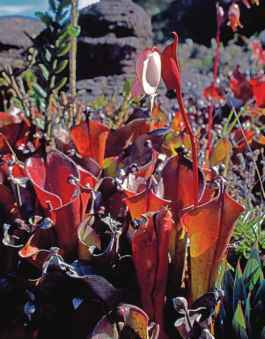 10.7), consisting of five closely related species, is found in the tepuis of the Guyanan Highlands where Roraima is the only known locality of the primitive marsh pitcher plant (Heliamphora nutans) which has been suggested (see Mabberley, 1997) as the ancestral type for the North American pitcher plant species Darlingtonia and Sarracenia. Orchids, due to their mycorrhizal associations, also flourish in this nutrient-poor habitat. described somewhat romantically as the 'Galapagos of the floral world' (Attenborough, 1995). The peculiar biogeography of Roraima and other tepuis in the neotropical Guyana region of Venezuela has generated considerable debate regarding the factors that are thought to account for modern vegetation patterns in the South American inselbergs. The ethos of Conan Doyle's 'Lost World' may possibly have influenced the objectivity of some studies. Rull (2004a) has questioned the view that these seemingly isolated plant communities on the high-elevation summits of South America all have a long history of evolution in isolation. Early estimations of the number of endemic species claimed very high levels of endemism (90-95%) but this has now been revised to a smaller but still very high level of 33% (Rull, 2004a). Examination of the pollen in Quaternary sediments of some tepuis gives an insight into past vertical migrations of vegetation in response to climate change, which supports the counterargument that the flora of at least some of the tepuis is not frozen in time as has been suggested by the more romantic 'lost world' view of their biogeographical history (Rull, 2004a,b). It would appear that a replacement of a high-altitude Chimantaea spp. paramo-like shrubland community by a lower elevation (<2300 m) Stegolepis meadow occurred about 2500 years BP (Stegolepis is a Rapateaceae genus confined to the sandstone tepuis of northern South America). Ecologically, these Chimantaea shrublands are a unique type of high-altitude vegetation, which has physiognomic and taxonomic affinities with the upper Andean paramos shrublands, due to the dominance of the caulirossulate (columnar rosette) growth forms belonging to the Asteraceae (Rull, 2004a). A decrease in temperature and moisture led to the establishment of present conditions after c. 1450 BP. It may therefore be concluded that the highland vegetation of the tepuis has responded in the past to climate shifts with vertical displacements, supporting the hypothesis of vertical floristic mixing. However, a physiographical analysis also shows that at least during the major part of the Holocene approximately half of the tepuis would never have been connected with lowland plant communities. This conclusion is borne out in the positive correlation of the number of endemic species with the height of the tepuis (Fig. 10.8). Both hypotheses are needed to explain the origins of the summit flora in inselbergs. These two points of view of a 'Lost World' or a flora that is interchanging through vertical migration need not be mutually exclusive and it is probable that both should be invoked in explaining the botanical history of the tepuis (Rull, 2004b). African inselbergs provide a somewhat different view of the ecology and biogeographical history of tropical, high-mountain tablelands. The west African inselbergs south of the Equator in Guinea (20-30° S) in the Nama Karoo biome have been considered as ecologically important refugia for plant species with a high recolo-nization potential for the surrounding arid landscapes (Burke, 2003). shown that local environmental conditions in West Africa can markedly affect the nature of the vegetation and the presence or absence of endemic species (Porembski, 2005). Examples of species restricted to the inselbergs are Pitcairnia feliciana (Bromeliaceae) and Microdracoides squamosus (Cyperaceae). Pitcairnia feliciana is of interest in that it is the only bromeliad species to have crossed the Atlantic. Some sandstone outcrops are rich in species and endemics, which is probably due to the combined effects of vertical differentiation, large area, long-term climatic stability and isolation. 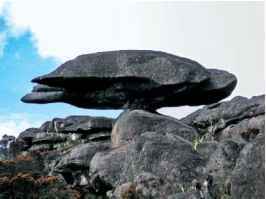 By contrast, granite inselbergs and ferricretes were found to have no local endemics and a lower number of species. The species richness of these rock outcrops is determined largely by the existence of suitable resources, with the most diverse inselberg vegetation being found in Tanzania, Malawi, Mozambique, Zambia, Zimbabwe and Angola (Porembski & Barthlott, 2000).